Paul T Davies reviews Florian Zeller’s The Height Of The Storm with Jonathan Pryce and Dame Eileen Atkins at the Wyndham’s Theatre. Those familiar with Florian Zeller’s work, particularly his UK breakthrough The Father, will find echoes of his plays in The Height of the Storm. An older man confused, with unreliable memories, his family trying to resolve a situation, “this house is too big for you Dad”, a mysterious visitor, a woman from his past who may be bringing a long buried secret to light. His work is fragmentary, cryptic, each movement seemingly revealing new information whilst muddying facts at the same time, until everything is brought into sharp clarity at the end. This is an involving 80 minutes of theatre, beautifully acted, with a final scene that will linger long in the memory. 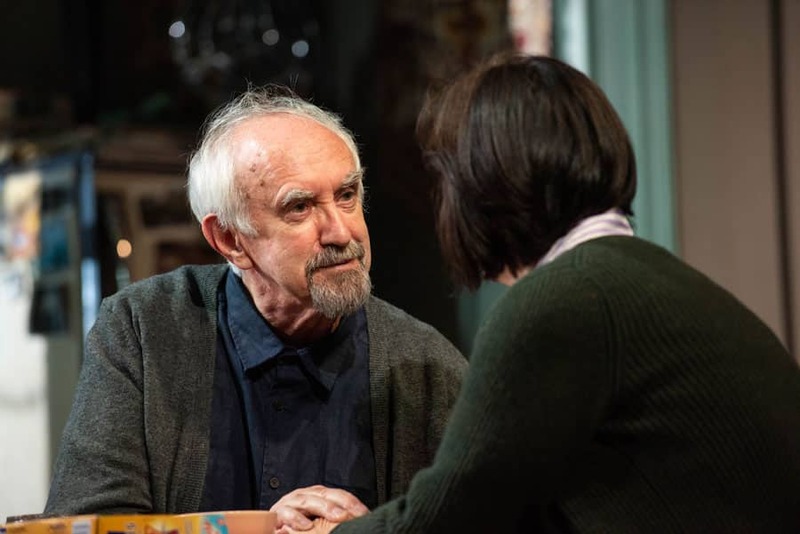 Jonathan Pryce is outstanding as Andre, a successful writer coming to the end of his life, confused, distressed, but, like all dementia sufferers, with moments of poetic understanding, brought forward by Christopher Hampton’s exemplary translation. His temper is sudden and loud, and he is constantly looking for his wife, Madeleine, only seemingly content when she is near. 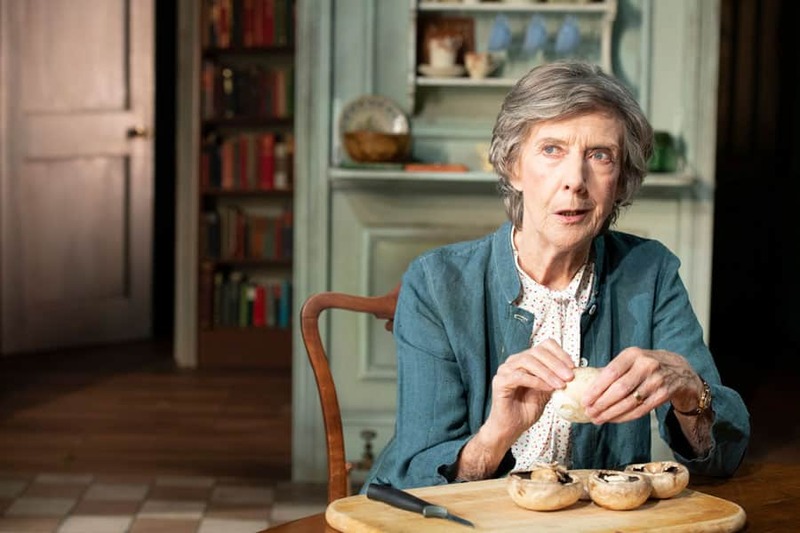 Eileen Atkins is, as always, excellent as Madeleine, particularly in her world weariness and her despair in her children- she wishes them gone when they visit. They both have a glare that can scan the entire auditorium, and she is perfect in landing hilarious lines that provide a release to the intensity of the situation. 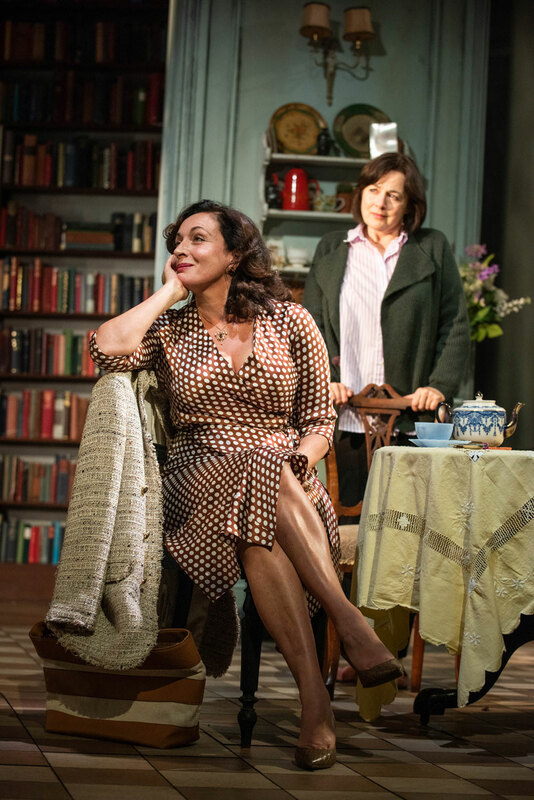 They both capture perfectly a relationship that has lasted for over fifty years; they are as one, which raises the whole point of the play. How does one half cope when the other half dies first? The two leads and the text create an archive of revelation, which is uncovered when their daughter Anne, Amanda Drew, channelling perfectly frustration with her parents, is tasked with the job of collating Andre’s unpublished and unfinished work. His personal diary brings forward a mysterious woman, who talks of her affair with another writer, and their son that she brought up alone, but is she referring to Andre? The Woman, (Lucy Cohu), shifts identity, so we are always in the presence of unreliable witnesses. Anna Madeley as their other daughter Elise, and James Hillier as The Man, is the modern age, always on their phones, relationships changing, adding to the mystery. It’s a piece that demands your concentration, which they struggle to give to the elderly couple. The final scene beautifully brings everything into sharp focus, with conversations about mushrooms being given a disquieting meaning. Above all, it is a declaration of love that will pierce your heart. The play begins the morning after a storm, and we never experience the storm weather wise. Perhaps the storm is the confusion raging in Andre’s brain, but the final scene explains it with utter, distilled, beauty. See this for acting of the highest quality, a lighting design that pulses with the script, and Jonathan Kent’s tender direction.